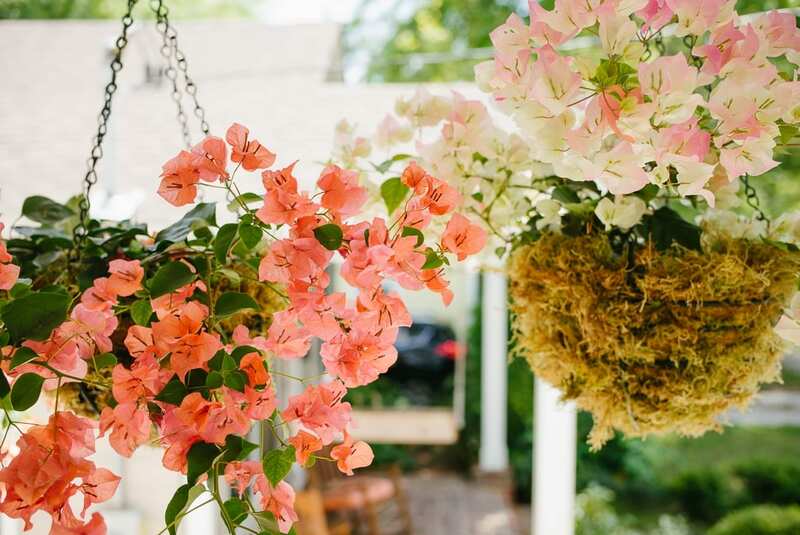 We were so excited to bring home some hanging baskets of bougainvillea last week. 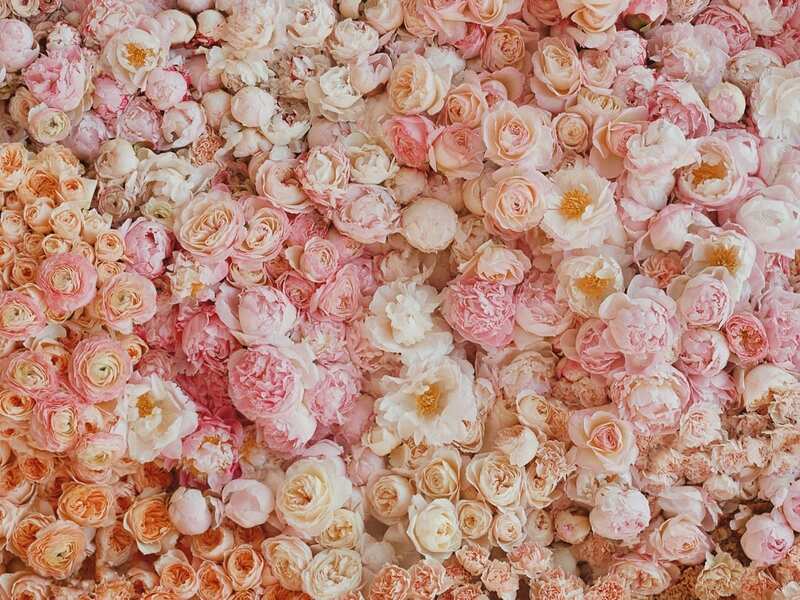 I am really drawn to their sprawling nature and fantastic colors (I think we all are!). 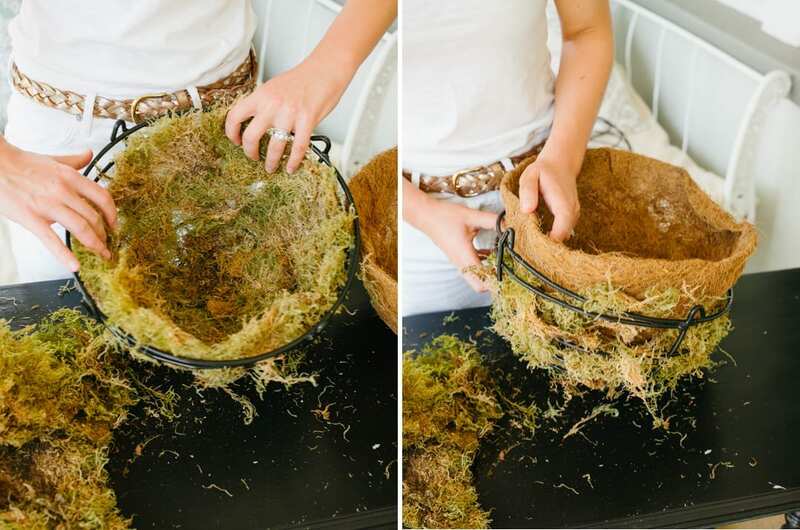 We decided to place the retention pot that they came in inside a more traditional hanging basket, and to soften the “new” feel of the basket with moss, all purchased at the same garden center. 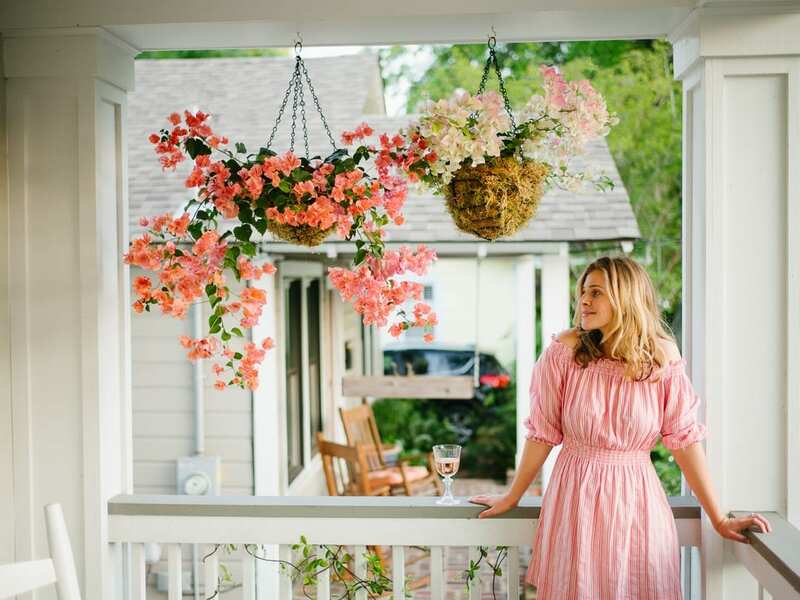 They were so simple and easy to install on the porch and we could not be happier with the results. First, we broke up the moss and lined the wire section of the hanging baskets (which I will spray paint white next time); it was surprisingly tricky to place the liner inside without the moss getting squished to the bottom of the planter but, with a little bit of teasing and supplementing, it ended up looking a bit more intentional. 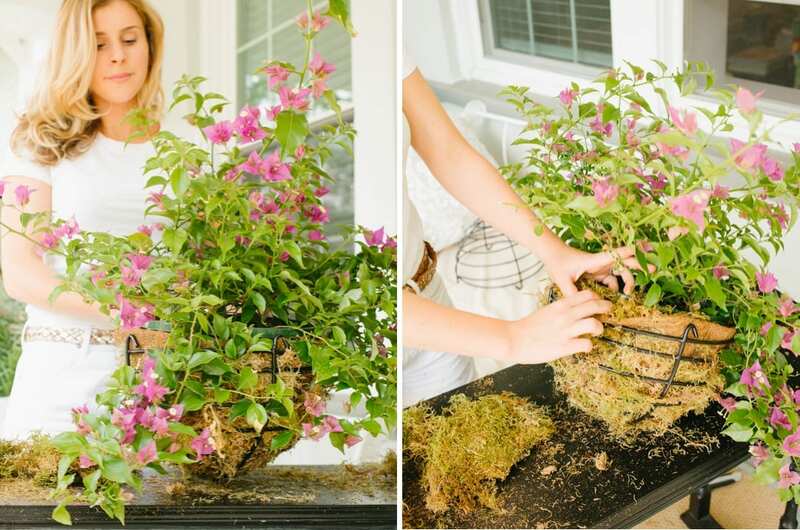 After placing the bougainvillea in the hanging baskets, we tucked more moss between the edge of the plastic and the liner to make sure the plastic was completely hidden. I used scissors to tidy up each basket before hanging it up. Will was actually a lot better at it than I was, he has more patience than I do! I can therefore say (without bragging) that I think they look pretty good! At least a bit more organic than the plain planter. We know that we will be enjoying lots of evenings on the porch — either on the daybed, or in the rocking chairs — and that it will be so nice to admire the beautiful colors of the bougainvillea. Gorgeous! 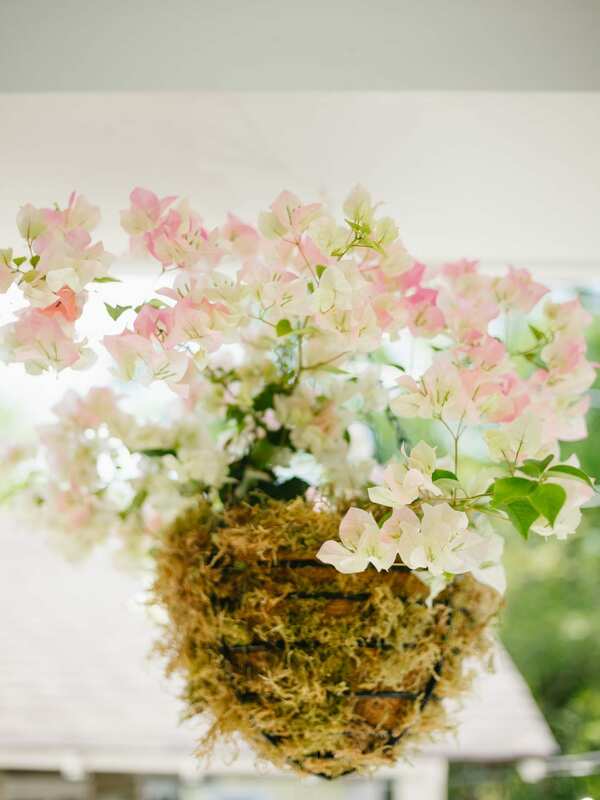 Love love love the bougainvillea! We are moving to a house with a porch and I really want to put a day bed out there! Do you keep the pillows/linens on it or do you keep them inside and only bring them out for special occasions? I’m worried they will get ruined if we leave them outside.